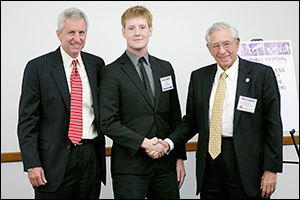 BioE graduate student and 2008 Fischell Fellow Marc Dandin (left) is congratulated by department benefactor and namesake Dr. Robert E. Fischell (M.S. '53, right). 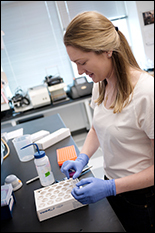 "I believe this award will allow me to focus on taking my research ideas beyond the concept stage and address unmet needs in the biotechnology industry." — Marc Dandin, 2008 Fischell Fellow. 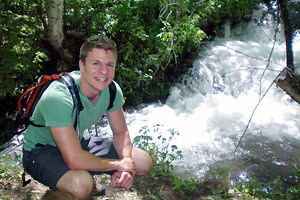 Graduate Program in Bioengineering graduate student and alumnus Marc Dandin (B.S. 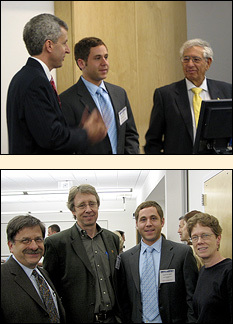 '04, electrical engineering) has been named the 2008 recipient of the Fischell Fellowship in Biomedical Engineering. 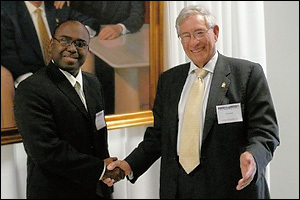 The announcement was made April 11 at the second annual Fischell Festival by Fischell Department of Bioengineering Professor and Chair William Bentley and department benefactor and medical device inventor Dr. Robert E. Fischell. The fellowship is a unique opportunity for talented and innovative graduate students interested in applied research and product design in the biomedical industry. It features a $35,000 12-month stipend, full tuition waiver, full health benefits, and is renewable for up to 5 years. 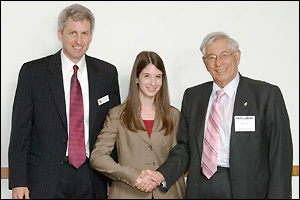 Dandin is co-advised by Department of Mechanical Engineering Associate Professor Elisabeth Smela and Department of Electrical and Computer Engineering Assistant Professor Pamela Abshire. 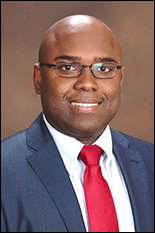 He works in both Smela's Laboratory for Microtechnologies and Abshire's Integrated Biomorphic Information Systems Laboratory. 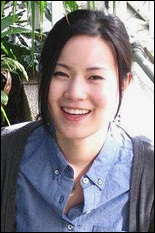 Dandin's winning proposal, "Optoelectronic Microsystems for Pathogen Detection," describes the design, testing and commercialization of a "lab on a chip"-style biosensor capable of detecting dangerous pathogens present in quantities of only 10-50 cells, and analyzing and reporting results within minutes. The device would target common foodborne toxins such as E. coli and salmonella, which, along with others, account for millions of illnesses, hundreds of thousands of hospitalizations, and thousands of deaths each year in the United States. It could also be used for drug discovery, screening, and clinical diagnostics. The target market for the product includes hospitals, healthcare providers, and food and water safety agencies and inspectors. 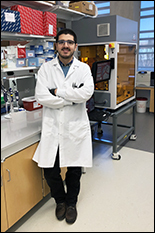 "Miniaturizing the bench-top equipment used in cell-based studies offers, other than cost reduction, tremendous advantages," Dandin explains. "In the case of diagnostics, small and portable devices will allow faster detection in locations where conventional laboratory hardware are inexistent or offer limited functionality." Dandin credits BIOE645: Advanced Engineering Start Up Ventures, a course taught by Maryland Technology Enterprise Institute (MTECH) Professor David Barbe, with preparing him to apply for the Fischell Fellowship, which requires applicants to submit a business plan describing their ideas to develop and market a biomedical device. "The Fischell Fellowship is an excellent incentive for engineers and scientists who want to formulate high impact technological solutions to current problems in health care," he says. "I entered the competition because the fellowship advocates the combination of science, engineering, and entrepreneurship in order to help improve and save human lives. I believe this award will allow me to focus on taking my research ideas beyond the concept stage and address unmet needs in the biotechnology industry." Dandin Authors "A Letter from Haiti"